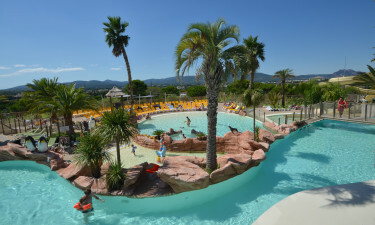 Holiday in style at the luxurious Club Colombier campsite on the mythical French Riviera. Get set to feel like a vacationing film star at the Club Colombier luxury camping site! Sitting between Cannes and St-Tropez, and just 4km from one of the most glamorous stretches of coast in the world, Club Colombier’s exceptional facilities are in keeping with its glorious surroundings. 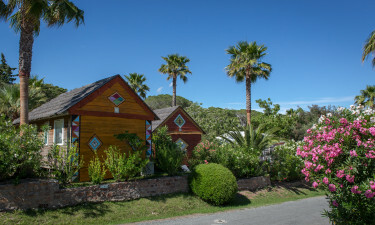 Why stay at Club Colombier? The tropical heated pools with their gently sloping beaches and turquoise waters create the feel of a Caribbean idyll. Stretch out in the sun on one of the relaxation islands, take a leisurely swim along the lazy river, or watch from one of the pretty wooden bridges that link the pools as your children play on the 6 slides and serpentine water chute, or splash about in the toddler’s pool. Why not simply laze poolside with a refreshing drink on a sun-lounger under one of the palm trees or shade sails. The multi-level pools also offer fantastic views of the countryside. For a gentle workout try one of the free water games or water fitness classes. Scuba diving and swimming lessons are available in the lagoon for a modest additional fee. For a spot of pampering, treat yourself to the many delights of the optional Vitality pool, which is exclusively for adults. The outdoor covered gym area allows you to train whilst enjoying the fresh air and sunshine. Feeling competitive? Make a team selection and show off those slick moves at volleyball, basketball, half-court tennis and 5-a-side football. If that sounds too much like hard work, the French pastime of boules is a more laid-back alternative. The courts and pitches are lit at night for games in the evening. Children have 4 playgrounds covering an area of 1km², with a huge selection of slides, inflatables, wooden toys, a giant rope pyramid and other colourful apparatus. Club Colombier also runs animation programmes for all ages. The beach of Fréjus is just 4km away. Visit the campsite’s Tourist Office for water sport activities. Take the night boat to St-Tropez and experience the magic of the sparkling Côte d’Azur coastline. The Panorama restaurant bar and takeaway overlooks the lagoon pool complex. Dine or have cocktails on the terrace and enjoy the marvellous view. The Paillotte grill serves regional specialities and low calorie meals. Its terrace overlooks one of the enchanting Vitality pools.